Smartphones and compact cameras are fine for casual photography, but they’re limited by their small sensors and fixed lenses and they don’t really offer the kind of control you need when you want to take your photography that little bit further. 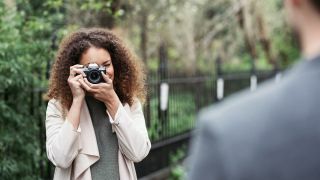 So an interchangeable lens camera makes the perfect upgrade, and we’ve picked out the ten best entry-level mirrorless cameras that can fit your budget, fit your pocket and won’t fry your brain as you learn how to use them. Most mirrorless cameras in this group have APS-C sensors, but some of our favourites have slightly smaller Micro Four Thirds sensors. Both offer such a big improvement over smartphones and compacts that really there’s little to choose between them. To find out more about sensor sizes, take a look at our sensor guide. Mirrorless cameras also offer interchangeable lenses. They usually come with a general-purpose 3x ‘kit’ zoom lens, but you can also get telephotos, macro lenses, super-wide-angles and more. It’s worth checking the lens ranges on offer, particularly if you might want to upgrade to a better camera in the range later on. Lastly, there’s value for money. There are some very inexpensive cameras here that will do a good job, but this inevitably means they cut back on features and controls and you need to make sure you’re not missing out on something you really need just to save a little money. For example, the cheapest mirrorless cameras don’t usually have viewfinders, but these can be invaluable for shooting in bright light, when the screen on the back can easily get swamped, so we’d always recommend stretching to a camera with a viewfinder if you can. Check out the specs of the rear screens, too. The size and resolution are not so important since they’re all quite similar these days, but a touchscreen display will make the camera feel more like a phone. Many new users will be bewildered by screens they can’t tap or swipe, but there are still a few cameras around which don’t have touchscreens. Finally, if you like to shoot video, you might want a camera that can shoot 4K, and not all of them can. This is a relatively new area for entry-level mirrorless cameras, and they don’t all do it (though they do all offer regular 1920 x 1080 Full HD). All the mirrorless cameras we’ve chosen for this list are well suited to beginners because of their price, size, ease of use, features or all of those things. You can also take a look at our other buying guides below if you're still undecided. Otherwise, read on to see the 10 best entry-level mirrorless cameras you can buy right now. The jewel-like E-M10 Mark III is styled like a DSLR, with a viewfinder mounted on the top, but this camera is so small it scarcely takes up more space than mirrorless cameras with no viewfinder at all. It has a Micro Four Thirds sensor a little smaller than the APS-C sensors used by rival makers, and 16 megapixels rather than the usual 24, but the smaller sensor means smaller, faster-focusing lenses, and you’re not likely to notice the difference in megapixels in real-world shooting. What you will notice is this camera’s great build quality and finish, its responsiveness, its excellent built in Art Filters and the rather clever shooting options in its Advanced Photo mode. Olympus offers a good range of lenses, too. While the absence of an X Trans sensor is a little disappointing (Fujifilm's premium sensor), the reality is that this has allowed Fujifilm to price the camera a little more aggressively. It's also fair to say that for most photographers the difference will be negligible, with the X-T100 delivering some of the best results you'll see from an entry-level mirrorless camera. 4K video capture capped at 15fps is also a bit of a let down, though, while focusing speeds can be a little bit slow on occasion. Otherwise, Fujifilm's new entry-level mirrorless camera doesn't disappoint. Lovely to look at and use, the X-T100 is a great choice if you're looking for your first mirrorless camera. The Lumix GX80 (known as the Lumix GX85 in the US) from Panasonic is great value given the features on offer. These include a built-in viewfinder and 5-axis dual image stabilisation which combines in-body stabilisation with lens-based stabilisation. As usual with Panasonic cameras, this one offers 4K video and 4K Photo modes. These include a Post Focus mode where the camera rapidly captures a series of images at different focus points so that you can choose the one you want later. With the 12-32mm kit lens, the Lumix GX80 / GX85 is both powerful and affordable. Don’t let the price fool you. The A6000 costs the same as other entry-level mirrorless cameras, but it’s an advanced and powerful and has only dropped to this price through being on the market since 2014! Despite this, its specs still look good today, including a 24 million pixel sensor, a fast hybrid 179-point autofocus system and continuous shooting at 11 frames per second. Its age shows in other areas, though; it only shoots full HD video not 4K, and the screen isn’t touch sensitive. And while it’s cheap enough, the A6000’s high-end features make it a little advanced for beginners. Until the release of the M50, only one of Canon’s mirrorless EOS M cameras had a viewfinder, and that was the pricey EOS M5. All the more affordable models just had the rear screen for composing pictures. The EOS M50 could be Canon’s most important EOS M model yet, then, offering a viewfinder and a host of other tempting features – including 4K video – at a far more beginner-friendly price. It’s not perfect – the 4K video mode doesn’t use the full frame and the camera does have a somewhat plasticky feel – but it’s still a good camera. Olympus is not the only company to make Micro Four Thirds mirrorless cameras. They’re also made by Panasonic and, in fact, the lenses are interchangeable. Where Olympus cameras are all about style and creativity, Panasonic cameras are at least as technically capable but a little more down to earth. And they don’t come much more down to earth than the Lumix GX800 (known as the GX850 in the US), which combines small size with powerful features and exceptional value. You don’t get a viewfinder, but you do get 4K video and Panasonic’s 4K Photo modes, a 180-degree selfie screen, touch control and a terrific little 12-32mm retracting kit lens. Fujifilm has made its reputation with its high-end X-mount mirrorless cameras, but it also makes a series of simpler X-A cameras for novices. The X-A5 is the latest addition, and sports a brand new retracting 15-45mm kit lens which makes the camera far easier to cram into a bag. There’s no viewfinder, but the touch-screen display works very well and flips through 180 degrees for selfies. The image quality is terrific, even though its regular CMOS sensor rather than Fujifilm’s special X-Trans sensor, though the 4K video mode only works at 15fps, which is a let-down. Launched in the same year as the A6000, the A5100 is also a highly competent camera whose price has dropped to seriously tempting levels. It’s a lot cheaper than the A6000, but there’s no electronic viewfinder and the external controls are simpler. Sony has done an amazing job to make a camera this small but it does leave it feeling slightly dwarfed by the 16-50mm kit lens. The A5100 does, however, have a 180-degree selfie screen. Worryingly, Sony has not launched a new APS-C mirrorless camera since 2014, and few new lens for these APS-C cameras. The A5100 is a bargain, but is it the end of the line? Canon’s cheapest EOS M model is very competitively priced and offers an easy introduction to interchangeable lens cameras for smartphone or compact camera upgraders. But to make it ‘simple’, Canon has taken away a lot of the external controls, which means you spend more time in the menus and touchscreen interface. The plain rectangular body is also a little awkward to hold and shoot with. It doesn’t always capture sharp shots in low light, either, when rival cameras manage this perfectly well. The EOS M100 is small, simple and affordable nonetheless. The Olympus PEN series is aimed squarely at beginners and smartphone upgraders, catering specifically for fashion-conscious bloggers and Instagramers. It does this with a blend of style, responsiveness and image quality that’s instantly endearing. Olympus’s ‘EZ’ pancake lens is a must-have companion for this camera, offering a 3x zoom range in a super-slim retracting design that means the PEN takes up little space in your bag. The latest of these is the E-PL9, which brings 4K video and better image stabilisation over the older model. That said, the E-PL8 is almost as good and that bit cheaper than the newer camera, this is still worth consideration as well. We think the older design looks better too!